Imagine having to carry your passport with you just to go for a leisurely summer boat ride. For season residents of one Manitoba campground, it's a reality. Imagine having to carry your passport with you just to go for a leisurely summer boat ride. For seasonal residents of one Manitoba campground, it's a reality. Lake Metigoshe borders the Canada-U.S. boundary in Turtle Mountain Provincial Park, southwest of Boissevain, Man. The majority of the freshwater lake sits in the United States, however the northern tip sits in Canada and is popular with recreational boaters. In fact, some of the boat docks for Canadian cabins sit on the U.S. side of the border. The area is about 250 km southwest of Winnipeg. But according to area boaters, previously lax rules that allowed them to freely boat the waters have changed, making boat rides a lot less leisurely. "There is a one central location at Hamilton (Ontario) that has a direct line and we have to call in every time we cross the Canadian-American water line of sorts," said Noreen Johnston, secretary-treasurer of the Lake Metigoshe Improvement Association. Johnston said as of April 1, boaters were required to call the Canada Border Services Agency (CBSA) every time they crossed over the border, even if just out for a recreational boat ride and even if they didn't dock in the United States. She said many boaters were caught off guard by the rules. "There's a lot of boaters, cabin owners here now that still didn't know that they had to call and don't understand why because they didn't get a letter [explaining the rules]," she said. "If you don't land on the U.S. side and you just decide to go on a boat ride, we only have about 200 metres of Canadian water, so more often than not we are in the U.S. water, " Johnston said. "From there, when you come back, prior to going to your cabin you go to the customs phone and you call Hamilton." Johnston said the customs phone on shore often has problems, like extreme static or connection problems. She said some have also reported long waits for service, including once when it took nearly 20 minutes to process six people on the phone. "Everybody on the boat has to have a passport. They want your middle name, your birth date, your [passport] expiry date," she said. "We can call from our cell phone when we get to Canadian water prior to docking at a private dock." But, she said using a cell phone runs the risk of facing U.S. roaming charges or other high long-distance fees. "They implement this rule and yet they can't help us with it," Johnston added. CBSA admits it's nearly impossible for boaters to use the lake and not cross the border. The CBSA said in a statement that boaters have always had to report once they return to dock on the Canadian side. "The only change is that boaters on Lake Metigoshe no longer need to acquire a permit from the local port of entry," a statement to CBC News read. "It is now a CBSA-designated Telephone Reporting Site." 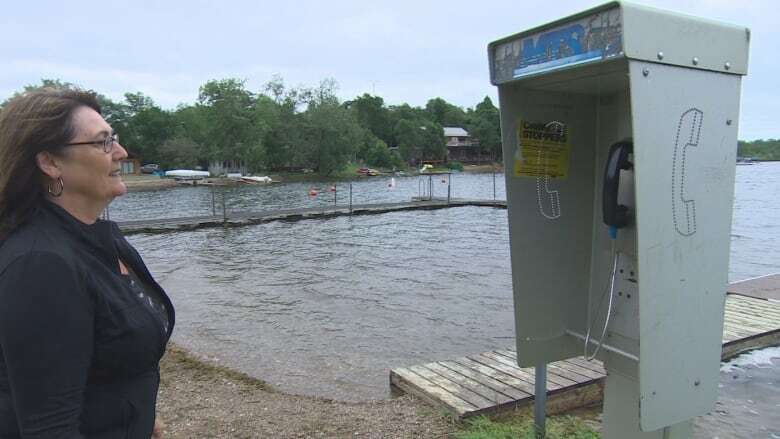 The CBSA said the change to use the telephone system was made to improve service to boaters in the area. But Johnston doesn't agree. "It just seem ludicrous to a lot of people and there is a lot of annoyance going around," she said. "Just to go for a boat ride and to let them know you went for a boat ride is a little weird for us now." She said the rules would be much easier to follow if the CBSA allowed boaters to call-in from their cabin landline or another telephone. She said boaters could previously use the waters freely with vessel permits from both countries. "It feels like we're doing something illegal and we're not. We're just going for a boat ride."